Description: An air bag is a flexible membrane or envelope that rapidly inflates during an automobile collision so as to cushion the impact. The air bag system includes a crash sensor module that deploys the airbag upon impact. 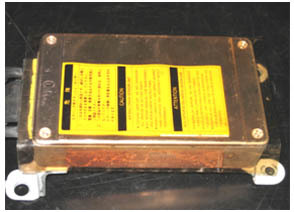 A limited number of older vehicles (pre-1994) contained mercury switches in the crash sensor module. 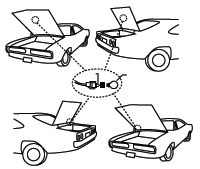 Each vehicle had one crash sensor module typically containing two mercury switches. The air bag crash sensor modules were commonly located under the center console on the drive line tunnel, on the floor pan below the driver's seat, or behind the glove box. 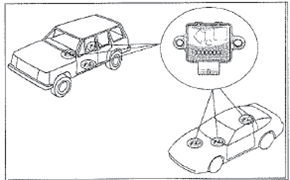 Purpose of the Mercury: The mercury switches located in the air bag crash sensor module conduct electricity, which triggers the air bag to inflate upon collision. Potential Hazards: As long as the vehicle remains intact, there is a low probability that there would be a mercury release. However, if the mercury switch is not removed prior to the vehicle being shredded at a scrap metal recycler, the mercury switch becomes compromised and mercury can be released to the environment. Note: air bag inflation units also contain pyrotechnic devices that inflate the air bag during a crash. Removing them requires special training, and they are not part of the vehicle mercury switch recovery program. Only the air bag crash sensor modules, which contain a mercury switch, should be removed. Recycling/Disposal: End-of-Life Vehicle Solutions Corporation (ELVS) has set up a nationwide program designed to encourage the proper removal and disposal of mercury switches, including air bag sensors, from automobiles (except in Maine, which has a separate program). Participating automobile dismantlers can remove the mercury switches and send them for proper recycling and disposal, all expenses paid. In states where there is no mandatory switch removal legislation, a financial incentive is provided through the National Vehicle Mercury Switch Recovery Program (NVMSRP). Statutes and Other Information: A limited number of automobile manufacturers used mercury acceleration sensors for air bags crash systems in some vehicles during the model year period of 1984-1993. Vehicles manufactured after this timeframe do not contain a mercury switch. Maine and New York prohibit the sale of new automobiles that contain any type of mercury switch – including those found in air bag crash sensors. 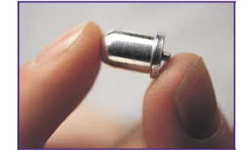 Other states, including Illinois, Massachusetts, Minnesota, North Carolina, and Rhode Island, do not specifically identify mercury switches found in air bag crash sensors as prohibited, but do require all mercury switches to be removed from end-of-life vehicles prior to crushing, shredding, and smelting the vehicle for disposal. Maine and New York also have this requirement. Description: Anti-lock brake systems (ABS) in automobiles prevents the wheels from locking while braking, allowing the driver more control during a skid. A typical ABS is composed of a central electronic unit, up to four sensors (G-force), and two or more hydraulic valves on the brake circuit. In some vehicles manufactured prior to 2004, mercury switches were located in the G-force sensors. Each of these G-force sensors contained two to three mercury switches embedded in plastic and were located in the drive tunnel; below the rear seat on the floor pan; and on the left frame rail, directly below the driver. Purpose of the Mercury: The G-force sensor in a vehicle's anti-lock brake system detects deceleration and takes the vehicle out of 4-wheel drive during slipping, thus preventing an out-of-control skid. The mercury switches located in the ABS G-force sensor conduct electricity in the brake circuit. Potential Hazards: As long as the vehicle remains intact, there is a low probability that there would be a mercury release. However, if the mercury switch is not removed prior to the vehicle being shredded at a scrap metal recycler or crushed in a landfill, the mercury switch becomes compromised and mercury can be released to the environment. Recycling/Disposal: End-of-Life Vehicle Solutions Corporation (ELVS) has set up a nationwide program designed to encourage the proper removal and disposal of mercury switches, including anti-lock brake systems, from automobiles (except in Maine, which has a separate program). Participating automobile dismantlers can remove the mercury switches and send them for proper recycling and disposal, all expenses paid. In states where there is no mandatory switch removal legislation, a financial incentive is provided through the National Vehicle Mercury Switch Recovery Program (NVMSRP). The ABS speed sensors located in wheel units do not contain mercury and do not need to be removed prior to disposal. Only the ABS control modules that contain a G-force sensor with a mercury switch should be removed. Statutes and Other Information: Many automobiles manufactured prior to 2003 contained mercury switches in the anti-lock brake system. 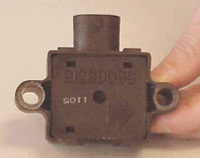 However, not all vehicles with ABS G-force sensors contained mercury switches – some manufacturers never used mercury switches and others phased-out mercury switches in the mid-1990s. The use of mercury switches in anti-lock brake systems was phased-out of all vehicles as of model year 2004. Many states, including Maine, Massachusetts, New York, and Washington prohibit the sale of new automobiles that contain mercury switches in their anti-lock brake systems (ABS). Other states, including Illinois, Maine, Massachusetts, Minnesota, North Carolina, Rhode Island, require the mercury switches to be removed from end-of-life vehicles prior to crushing, shredding, and smelting the vehicle for disposal. Description: Most cars have lights located in or near the ceiling of the passenger compartment, and in the hood, trunk, and other locations, to provide illumination. These "convenience lights" often have an option to switch on when the doors, hood, or trunk of the vehicle are opened, and many of the automobiles manufactured prior to 2003 contain a mercury switch to do this. The mercury light switches were typically located in the hood or trunk convenience lighting system, although a limited number of cars may also include them in the vanity mirrors (e.g., Volvo). There is also anecdotal evidence that some cars included convenience lighting systems in the engine compartment, glove box, and other storage compartments; however specific manufacturers or models with this have not been identified. Purpose of the Mercury: The mercury switch in the convenience light system is used to conduct electricity. For example, when the trunk or hood of a vehicle is opened, the mercury switch turns the light "on." Potential Hazards: As long as the vehicle remains intact, there is a low probability that there would be a mercury release. The mercury switches commonly found in vehicles are encased in metal and are not likely to leak or break. However, a limited number of car manufacturers had some models with convenience light systems in engines, luggage compartments, and vanity mirrors that included mercury switches encased in a glass ampoule, which is more susceptible to breaking. It is important not to mix these glass ampoules with the metal switches in the same container because if the glass breaks and mercury is released, the entire container of switches will be contaminated and must be managed as hazardous waste. Regardless of the type of mercury switch (metal or glass), if it is not removed prior to the vehicle being shredded at a scrap metal recycler or crushed in a landfill, the switch becomes compromised and mercury can be released to the environment. Recycling/Disposal: End-of-Life Vehicle Solutions Corporation (ELVS) has set up a nationwide program designed to encourage the proper removal and disposal of mercury switches, including those in the convenience lighting systems, from automobiles (except in Maine, which has a separate program). Participating automobile dismantlers can remove the mercury switches and send them for proper recycling and disposal, all expenses paid. In states where there is no mandatory switch removal legislation, a financial incentive is provided through the National Vehicle Mercury Switch Recovery Program (NVMSRP). Statutes and Other Information: Many U.S. made automobiles manufactured prior to 2003 contained mercury switches in the convenience lighting systems noted above. The use of mercury switches in convenience lights ended for all automobiles beginning with model year 2003. Many states, including California, Maine, Massachusetts, New York, Oregon, and Washington prohibit the sale of new automobiles that contain mercury light switches. Other states, including Illinois, Maine, Massachusetts, Minnesota, North Carolina, Rhode Island, require the mercury switches to be removed from end-of-life vehicles prior to crushing, shredding, and smelting the vehicle for disposal.